This is the Vol. 20 No. 1 - Thursday, Feb. 7 edition of the Flash! To get the Flash! regularly, sign up now! Daily Sale Page | Bye Buys! to your address book. Thank you. "He Loves Me Heart (White Daisy)"
"Red Heart with Gold Bow and Truffle"
"Candy Heart - I Love You"
"Gold Heart with Raised Flowers"
$229.99 or less! LAST ONE! 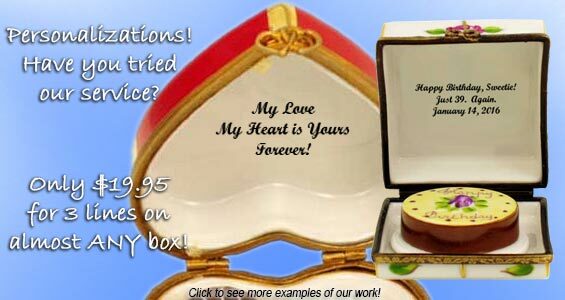 "Pink Gift Wrapped Box with Gold Ribbon"
"Studio Collection - with Love"
"Purple Floral Heart Ring Box"
$189.99 or less! LAST ONE! "Sealed with A Kiss Letter"
"Be My Valentine Pink Heart"
"Gift Box with Red Bow"
"He Loves Me Heart (Pink Daisy)"
$209.99 or less! LAST ONE! "Love Box with Chocolate Truffles"
"Pink and Yellow Standing Heart"
$169.99 or less! LAST ONE! 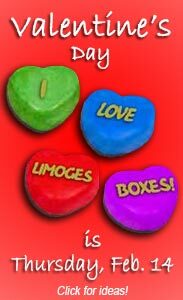 Happy (almost) Valentine's Day, Limoges Collectors! when you check out. For our Limoges Lovers, use your regular Limoges Lovers code for a special 15% discount! You MUST use your code though; our new automated order processing doesn't allow me to override order details anymore. If you don't remember your Limoges Lovers code, try your email address in lower case. Or, email us before you place your order. All discounts will apply through midnight Sunday, Feb. 10. Valentine's Day is only -64 days away! As always, be sure to check out our sale page and our Bye-Buys, as we have added a number of great boxes there. Thank you for your continued business! Sale prices and promotion codes are good through midnight CST of the date shown, and apply only to online orders (telephone orders are not discounted). All sales are first come, first served; no rain checks will be provided, and no other discounts apply to sale items, including Limoges Lovers discounts. If an item you order has sold out, we will email you to let you know and we will remove that item from your order.